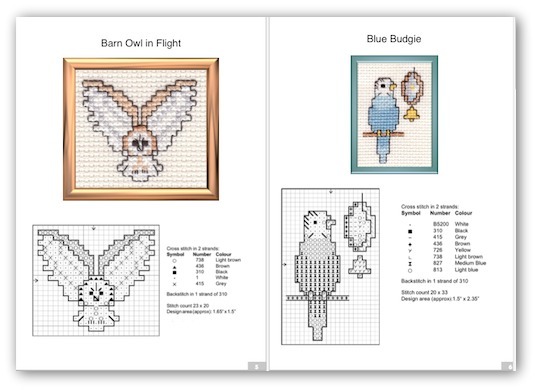 Looking for small cross stitch owls, chicks, geese, budgies or other birds? You will find them all in this downloadable ebook. There are fourteen simple to stitch patterns, each using no more than eight colors. No fractional stitches are used, making these cross stitch birds simple enough for youngsters or beginners to counted cross stitch. Instructions for working counted cross stitch from a graph are included in the book, and of course you can get tons of information on the craft here on the site also. Each design page includes the chart (or pattern), a color key and a clear colored photograph of the finished project, as shown by the double page spread pictured below. The price for the ebook is just £5.00! Snap up your copy today.